Simple information-splicing games come in handy because, in an intentional way, they disrupt the standard ways we break down topics. The 4Cs game is a quick way to gather and organize information about any subject using four common key concepts. 1. Before the meeting, decide on a topic you want the players to explore and draw a 2×2 matrix in a large white space in the meeting room. 2. 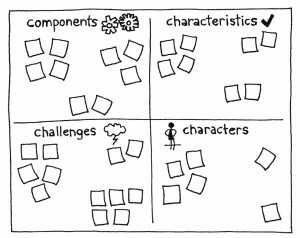 Write the following categories in each box of the matrix: “Components”, “Characteristics”, “Characters”, and “Challenges”. Then, draw something that represents each category. • Components are parts of the topic. For example, a component of a social commerce strategy might be responsive tweets. Components of a distribution channel might be 18-wheelers. 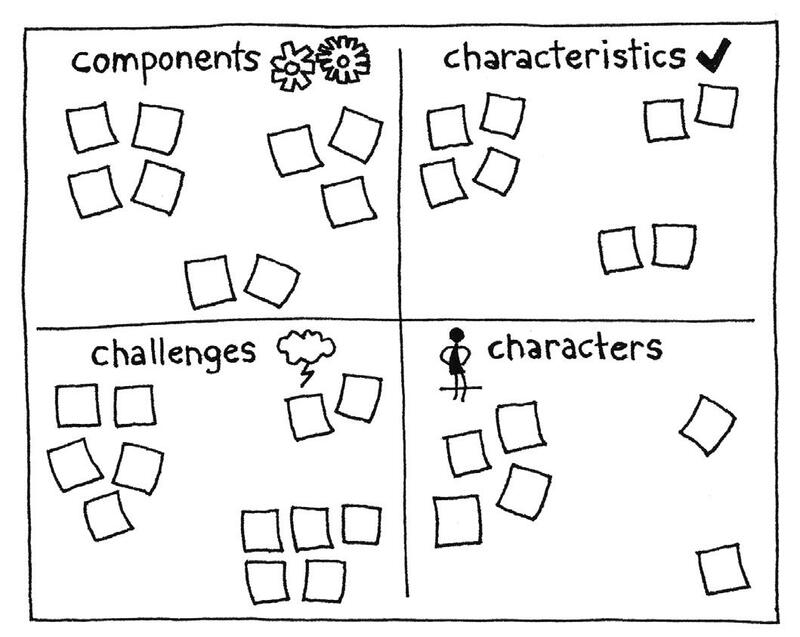 • Characteristics are features of the topic. For example, speed of response is a characteristic of a social commerce strategy. A characteristic of an 18 wheeler might be an inefficient use of fuel. • Challenges are obstacles associated with the topic. • Characters are people associated with the topic. You don’t have to use four “Cs” to conduct this game. You can be creative with other letters that are company or team-specific. Use four “Ds” to create your matrix and name them “Discover”, “Design”, “Damage”, and “Deliver”. Just make sure the categories you create will give you a meaningful way to look at a topic of interest. 4. Divide the group into four teams of roughly equal size. (A group of 5–7 people can work as one team.) Give them access to sticky notes and markers. 5. Assign a different “C” to each team and tell them their goal is to collect information about that “C”, specific to the topic. Tell them they’ll have three minutes to plan an information-gathering strategy, five minutes to collect the information, and three minutes to analyze and organize it. Also explain that they should collect information from as many people in the room as possible. 6. Announce the start of the planning period, and let the teams converse with one another. At the end of three minutes, call time. 7. Tell the players they can use their sticky notes and markers, then kick off the fiveminute information-gathering stage and stay out of the way. This stage of the game involves a lot of interviewing and moving around the room. Tell the players when the five minutes are up. 8. Start the three-minute information-analysis stage. In this stage, the players should analyze their data, organize it in a meaningful way, and post the contents in the matrix on the wall. 9. Close the game by asking for volunteers to present their group’s findings. After each group presents, ask clarifying questions (Is there anything missing? Do these items mean the same thing? ), and encourage the others to reflect on and add more information. You can also ask players if they want to share thoughts on their team’s information-gathering process—to discuss what worked and what could have worked better. The 4Cs is deliberately quick (and slightly chaotic) to avoid a situation in which people simply list information about what they know related to the topic. In this game, the players gathering information may already have a lot of detail about the topic, but they’ll inevitably learn something new through the process of interviewing others. Interviewing allows people who may not interact much the opportunity to do so. Because the time is short, they won’t dive into a substantive conversation; nevertheless, the chances are higher that someone will take away new content or a new perspective based on an interview. Avoid shortchanging the closing activity, even though it may be tempting to give the group more time to gather and analyze their content (and some of them will request it). The last stage of the game is important to spend time on because it allows the group to reflect on the content together, as a sort of group mind. If the meeting is based on a familiar topic, there will likely be many players who think they have a corner on information around it, so it’s important to discuss the 4Cs as a whole group. It exposes more ground to more people and invites a discussion that can bring new life to old content. The 4Cs is based on the same-named activity written by Matthew Richter in the March 2004 publication of the Thiagi GameLetter.